My favourite books are always those where not much happens except entire universes quietly change. Both the characters’ and mine. 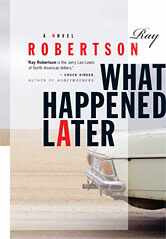 Ray Robertson’s What Happened Later is such a book. I read it twice last year. Each reading brought me deeper into the language with layers yet to be discovered. It’s all about the sentences. Written in two story lines—the first, a fictionalized account of Jack Kerouac’s last road trip, a kind of going home, to find his ancestral roots in Quebec. The second, a fictionalized account of a boy named Ray Robertson who’s trying to get away from home—1970’s small town, Ontario—and find a copy of On the Road. In alternate chapters and distinct voices, the stories weave back and forth through time—and not much happens. Except life. On every page, in very sentence—every word is full of what feels like absolutely raw truth—not fact necessarily (it’s fiction, right? ), but truth. —to Ray, living in this tiny, loving world of grandparents, leather sleeved sports jackets; where he so sweetly sings the national anthem to his father in the bathroom; a place where his greatest career challenge is climbing the ladder of the Sears sales team; a world of wry observations—when he accidentally kisses his own shoulder while making out with his first girlfriend, he reflects “…but that’s okay too…”. This mini philosopher, obsessed with finding the answers to life through Kerouac—all such delicious irony. Despite my love of the fiery, gorgeous, richly written Kerouac chapters—at the close of each, I found myself turning the page, eager and curious to read more of young Ray, and immerse myself in the very different but just as honest tempo of his life. In many ways it’s Ray’s story, but not completely, because to tell either of the two on their own would render both less. From the Re-Run Series: originally appeared in February, 2010.